The southernmost island of Key West is located just a few miles from one of the largest areas of coral reef gardens in the country. This coral reef ecosystem is massive, stretching from the Dry Tortugas islands in the Gulf of Mexico up to the coast of Palm Beach County in the Atlantic Ocean. This system is the continental United States's largest living coral reef ecosystem. Hundreds of thousands of travelers and Florida locals alike make their way out to the coral reef throughout the year to see the fascinating and unique marine world found at the bottom of the ocean. Our Key West Reef Snorkel adventure provides guests with complimentary sanitized snorkeling gear, instruction and tips by our helpful and knowledgeable crew, life jackets, and complimentary water and soft drinks. 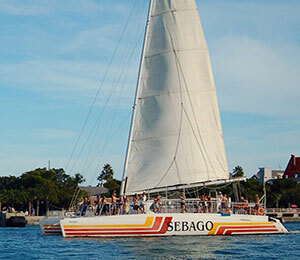 If you only have time to do one activity while you are in Key West Florida this time around, make sure that you go out on one of the unforgettable Key Sometimes the most basic things are the best. When it comes to snorkeling tours, our Key West Reef Snorkeling Adventure provides you with the most down-to-basics and, in turn, the most perfect, Key West snorkeling experience out there. Departing twice a day on a 3-hour journey out to the massive Key West coral reef ecosystem off the coast of Key West, our Key West snorkel offers you the chance to see the famous Key West coral reef gardens first hand! Once you take a peek underneath the surface of the water and see the beautiful, multi-colored display of the coral reef gardens, you will understand why this continues to be Key West's most popular water activity. Do I have to know how to swim for snorkeling? We ask that our guests feel comfortable in the water before booking a snorkeling tour. All guests will have the chance to wear a buoyancy vest while snorkeling. Swimming is not required, however. Where do you go for your snorkeling? We have various destinations that we go to for snorkeling. Our two main destinations include the Barrier Reef on the Atlantic side of Key West and Cottrell Key. I have been to the Bahamas many times, but Catamaran Reef Snorkel is one of my favorite trips! It includes everything that everyone should do here. As a Bahamas veteran, I can say only the best about this experience!